You're Here: Home / Blog / Digital Signage / News / Meet Ghani, our new Software Support Enginneer! 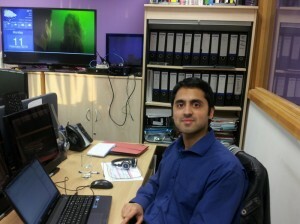 Meet Ghani, our new Software Support Enginneer! We’re thrilled to welcome Ghani Mohammed in our midst who starting with the 11th of February is our new Digital Screen Media Support Engineer. You may remember that we’ve advertised this position back in December so if you haven’t applied you’ve missed a great chance of joining one of the friendliest teams you have ever worked with. But more about Ghani- he is the person you are likely to talk to if you require support with our digital signage software, either POV or digitalsignage.NET. Before joining Dynamax, Ghani has acquired a solid software support experience at our sister company, Promethean where he worked as a Technical Support Analyst for 6 years. In this role, Ghani was in charge of troubleshooting software- related issues encountered by school teachers and other customers across Europe, Middle East and Africa. Ghani holds a Bachelor degree in Computing from the University of Wolverhampton and is now undergoing intensive training led by our colleagues, Andrew and Brian on our digital signage software solutions. To keep up to date with our corporate news, please follow Dynamax’s page on LinkedIn.